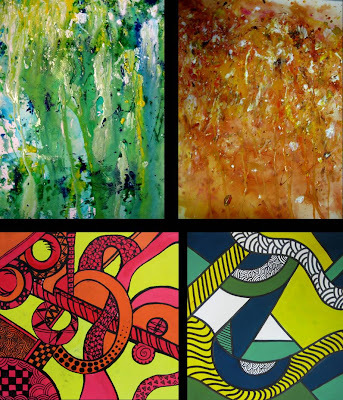 In this course, students are taught to combine different media such as dye, acrylic paint and Collage to create mixed media Art in abstract and semi-abstract forms. As an introduction, they were exposed to abstract work by artists like Jackson Pollock and Wassily Kandinsky on Action Painting and Abstract Expressionism. Their hands-on work were based on themes of 'Washing', 'My Room' and 'Jewellery'. Local artists' work by Goh Beng Kwan and Thomas Yeo were then introduced with them exploring Collage in mixed media. 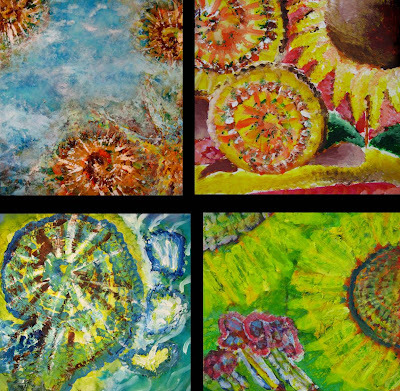 Themes like 'Shells' and 'Florals' were explored with their creation of semi-abstract work. 3D mixed media work is also covered with reference to Frank Stella's work in Maximalist Style. Students have explored semi-3D formation with use of their created 2D abstract work and some construction paper. They were worknig on ideas of 'Speed' and 'Dynamics' from theme of 'Sports'.